Far Cry Primal will go live on Steam at 12 am EST on March 1. But if you don't want to wait—and who likes waiting?—you can begin preloading the game right now. “Preloading” is simply the act of downloading a game onto your PC ahead of the time at which you can actually play it, so that when the magic moment arrives, BAM! You're playing! The benefit is obviously greater for gamers with slow connections than it is for those of you with ultra-fast fat pipes, but even if it's only a matter of 20 or 30 minutes, that's lost tortoise-killing time that you'll never get back. Far Cry Primal is about 15.5 GB, according to the announcement, so govern yourselves and your data caps accordingly. 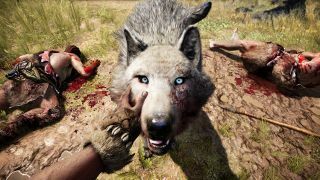 While you wait, I urge you to read our review—not of Far Cry Primal, but of Far Cry Primal's animals, in which James rides a tiger, mistreats owls, calls a prehistoric dog a bad name, and ponders the wisdom of giving beer to bears.